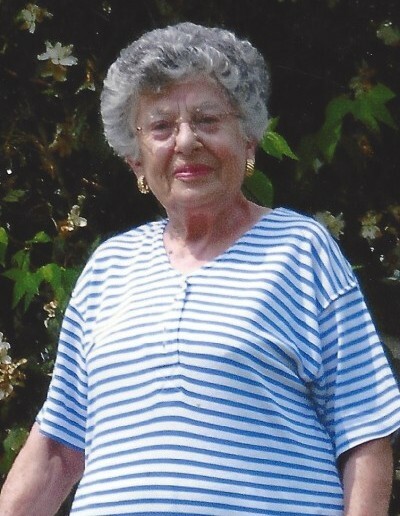 Obituary for Angeline (Bruno) Serinko | James C. Stump Funeral Home Inc.
Angeline Bruno Serinko, 101, of Rostraver Township, died Thursday, March 28, 2019. Born in Monessen on January 28, 1918, she was the daughter of the late Joseph and Maria (Nacarrato) Bruno. Angeline was a retired school teacher, having taught in the Monessen and Belle Vernon Area School Districts. She was a member of the Church of St. Anne in Rostraver Township and, in her earlier years, was active in the Church Choir and the Confraternity of Christian Mothers. She was also a member of the Catholic Women's College Club. Angie and her late husband, Reg, traveled extensively through Europe and the Mediterranean. For thirty years, they spent two weeks in January each year in Cancun. She also loved gardening and made many friends while out in the yard picking weeds. She is survived by her son, Dr. Regis J. Serinko Jr. of Bellefonte; sister-in-law, Dolores Serinko; nephews, Anthony (Pat) Calderone, Dr. Gerald Bruno, Bruce Bruno and James Bruno; nieces, Carmel Calderone, Maria (Kenneth) Kite and Judy (Gary) Mains. In addition to her parents, she was preceded in death by her husband, Dr. Regis J. Serinko Sr.; an infant daughter, Regina; and her siblings, Rose Bruno Calderone, Frank Bruno, Albert Bruno and James Bruno. Friends will be received on Friday, April 5, 2019 from 3 to 7 p.m. in the James C. Stump Funeral Home Inc., 580 Circle Drive, Rostraver Township (724-929-7934)www.jamesstumpfuneralhome.com where a Blessing Service will be held at 9:30 a.m. on Saturday, April 6, 2019 followed by a Funeral Mass at 10 a.m. in the Church of St. Anne, with Rev. Vincent J. Gigliotti presiding. Entombment will follow in Grandview Cemetery Mausoleum.